hey everyone, quarrygirl here. this is very exciting news. 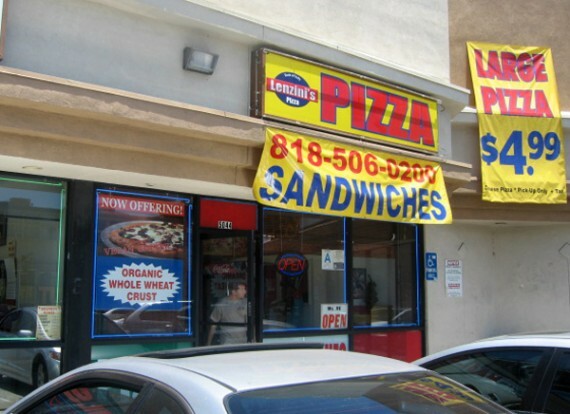 not only is there now a place to get vegan pizza delivered in north hollywood…but it’s cheap, authentic, take-out pizza as well. not fancy, specialty pizza like you find at most places in LA with vegan offerings. anyways, the following post is by field reporter brittany (of sick of lettuce). we’ve gone ahead and set her up with her very own qg username (check out the top of the post to see who it was written by), so after this i am gonna stop introducing her entries. enjoy! 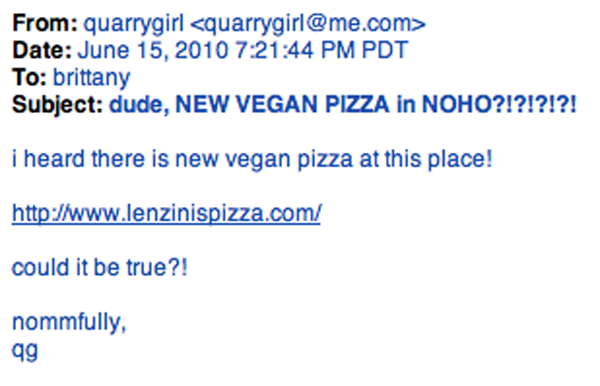 a couple days ago i got an email from QG alerting me to lenzini’s pizza in north hollywood, and the fact that they recently started offering vegan pizza. WHAAAT? 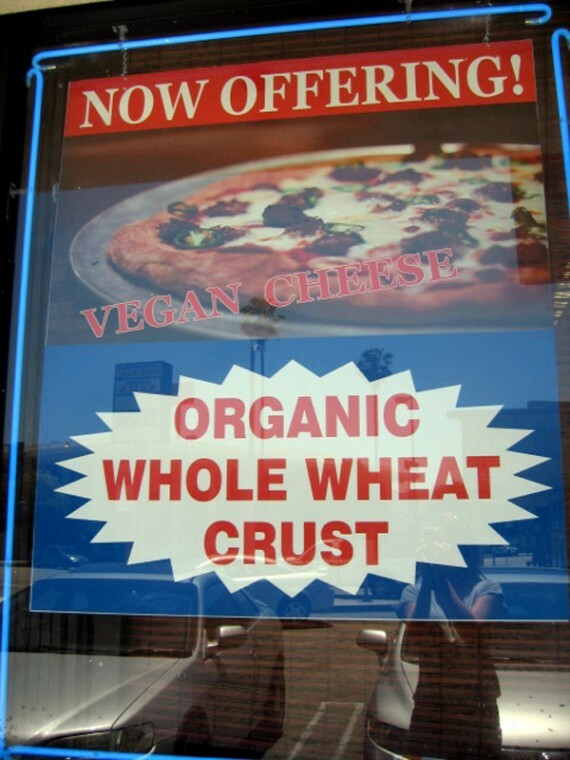 i was a bit skeptical that a random pizza place in noho was offering vegan pizza, so i double-checked ahead of time and found that 1) they use daiya cheese and 2) the dough is vegan as well. SCORE! i, of course, immediately sprang in to action (by immediately i mean a day later) and walked down to lenzini’s for lunch with some of my co-workers. after a short stroll we arrived at lenzini’s and started picking out toppings. 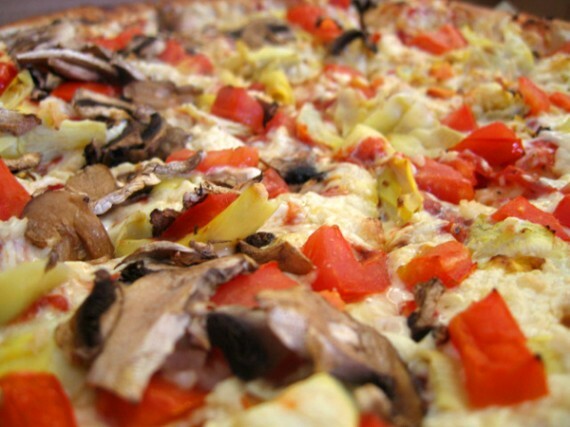 no faux meats on the topping menu, but there are a ton of yummy vegetable offerings. 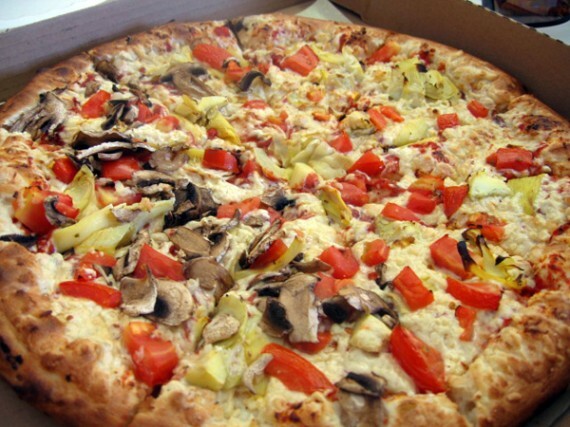 we decided to go with garlic, artichoke hearts, tomatoes, and mushrooms on half – we had a mushroom hater in the group. this pizza was delicious! the crust was light and airy, the sauce was great, there was tons of melty daiya, and the toppings were generous & fresh. we ended up getting a large and it cost $13.69 – i was expecting it to be more but they have a lot of specials posted. i was honestly a little confused by all the signage they have going on inside the shop and i don’t know which special we ended up getting, but i’m not complaining because i’m used to paying at LEAST $20 for a large vegan pizza, usually more. 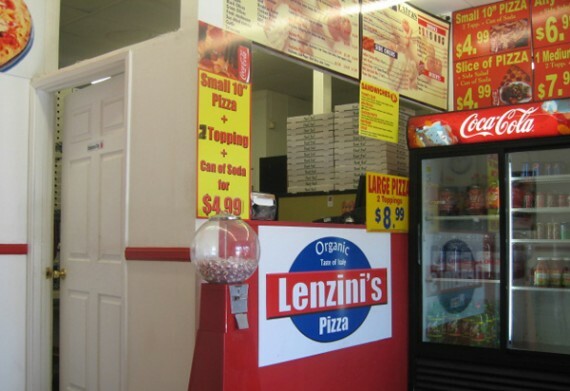 we chose to dine in because we were hungry and didn’t want to walk back to our office and delay our eating time any longer, but lenzini’s is probably more of a take-out place. there are a few tables, though, if you are impatient like we were. our pizza disappeared faster than it arrived (which was pretty quickly) and everyone left feeling pretty satisfied. even the omni in our group enjoyed the vegan cheese! i am a little afraid of how dangerously close this place is to my office, though, and have the feeling that there will be EVEN MORE pizza consumption in my future.